Today Brian and I ran in a race! 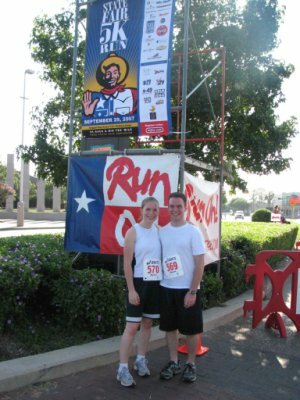 It was just a 5K run but we had a great time doing it – it was fun just to be back in that atmosphere again. We didn’t win any great prizes – the overall winner had a time of 14:55! He was booking it! I’m afraid 4 month pregnant and a little out of shape pushed my mile time up to 9min a mile but it was fun just to run again. Oh, and the fun thing about this run is that a ticket to the fair is included in everyone’s runner packet so I’ll be enjoying an outing sometime in the near future!